I want to obtain the transfer function of certain system (a ground "path", in this case) using an impact hammer for the excitation and one accelerometer (measuring vertical direction only) for the response. 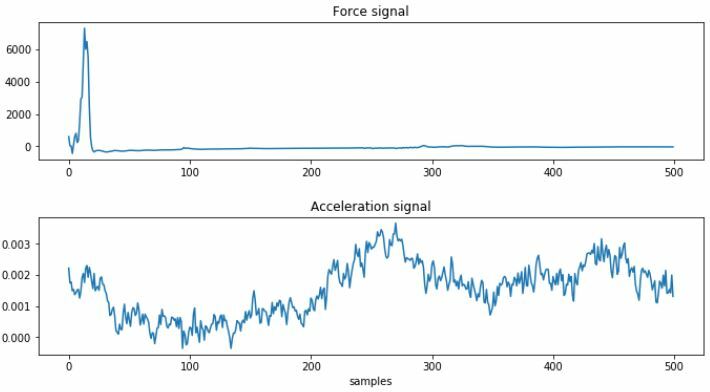 I performed 20 impacts and recorded those 20 force and acceleration signals since, in theory, that helps reducing noise by performing signal averaging. I perform signal averaging in the frequency domain both for the auto and cross spectra of the force and acceleration signals. The way I do this is by calculating the arithmetic mean accross the 20 signals, for each frequency bin. The noise level is quite big compared to that of the excitation response as it can be seen in the next figure (no clear response to the excitation is observed), so I am not sure if signal averaging is enough to solve the issue. 1) Am I implementing signal averaging correctly? 2) Is there any other way to reduce the noise present in the signals using the information that having 20 recordings of the "same" transfer function may provide? Browse other questions tagged signal-analysis fourier-transform noise transfer-function or ask your own question. What are some suitable methods for removing low-frequency line noise from measured data prior to system identification/deconvolution? Is this a robust method for analysing correctness of a filtered signal? Is there a more robust method?